Christmas Day lunch was at my sisters home, we invited 3 other friends to join us. This photo is fun, as it captured me with my paper hat on but look to the left - I have just about the same pose of the Queen Elizabeth magnet attached to her wall! I have used papers and embellishments from Paper Flourishes September Kit and the clusters of ribbon and die cuts top and bottom were inspired by a layout idea that came with the kit. It is all blue and sparkly - you can see the sequins glistening on this close up of the page. Here is the sketch from The Memory Nest. Fabulous! Love that regal pose! Thanks for using the sketch from The Memory Nest. BEAUTIFUL. I love the scalloped edges of your circles, i wish I had thought to do that, really makes a nice finished look. Thanks so much for joining the challenge at "The Memory Nest"
oh cute! Must have been a fun day together! thanks for joining us at THE MEMORY NEST! Fabulous take on the sketch!! 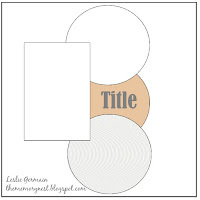 Love your circles (the patterned papers are pretty). Thanks for playing along with tMN!! Really pretty PPs for the circles! How funny about your pose, LOL! I love that December 25th tag also! Thanks for playing w/ us at TMN!